A program can be divided into a number of small processes. Each small process can be addressed as a single thread (a lightweight process). You can think of a lightweight process as a virtual CPU that executes code or system calls. You usually do not need to concern yourself with lightweight processes to program with threads. Multithreaded programs contain two or more threads that can run concurrently and each thread defines a separate path of execution. This means that a single program can perform two or more tasks simultaneously. For example, one thread is writing content on a file at the same time another thread is performing spelling check. When we run any java program, the program begins to execute its code starting from the main method. Therefore, the JVM creates a thread to start executing the code present in main method. This thread is called as main thread. Although the main thread is automatically created, you can control it by obtaining a reference to it by calling currentThread() method. 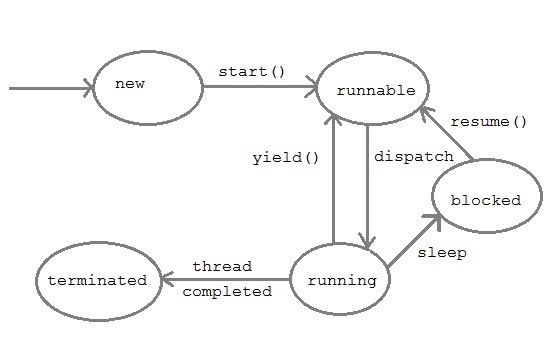 Runnable : After invocation of start() method on new thread, the thread becomes runnable. Running : A thread is in running state if the thread scheduler has selected it. Waiting : A thread is in waiting state if it waits for another thread to perform a task. In this stage the thread is still alive. Note: Thread priorities cannot guarantee that a higher priority thread will always be executed first than the lower priority thread. 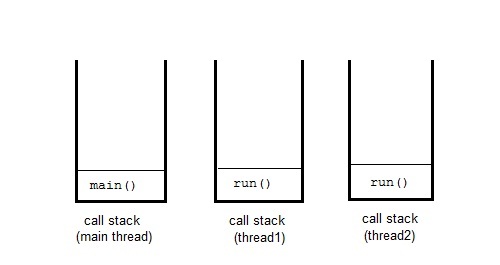 The selection of the threads for execution depends upon the thread scheduler which is platform dependent.